Edgar just hopes the bird doesn't poop. In honor of Halloween (the greatest holiday ever invented), I thought I'd present a list of some of thirteen classic scary, short stories. I hope you don't mind that all of my choices come from American Literature. 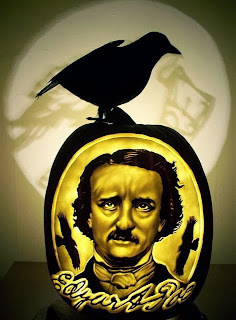 It's not because I'm intentionally favoring American Literature (which I am), but it's because I believe America that successfully co-opted Halloween with Pumpkins, Edgar Allan Poe, and Hershey's chocolate. But if you're looking for a good, American novel to read—one that will subtly frighten you with hellfire and damnation until you repent—I recommend "The Scarlet Letter." It's quite literally my favorite book. Here's some music that will talk your ears into talking your eyes into reading the book.